A call to Merle Wood & Associates brings news that Kurt Bosshardt has signed a 25.3m Ferretti 830 motor yacht for sale. Built by the Italian yard in 2008 with styling by Zuccon International, accommodation is for eight guests in a master suite, VIP stateroom and two twin cabins while a planing hull and twin 3,648hp MTU engines give her a cruising speed of 28.5 knots. Her large saloon comes with all the comforts of home and has a plasma screen TV. 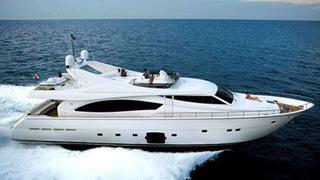 Currently in the Western Mediterranean, the Ferretti 830 is asking €2,490,000.